- The Harris and Caldwell XLA "S" type bipods allow you to tilt or cant your rifle side to side to level your crosshairs. It's a great system. However, the friction tensioning knob is hard to adjust with your fingers. 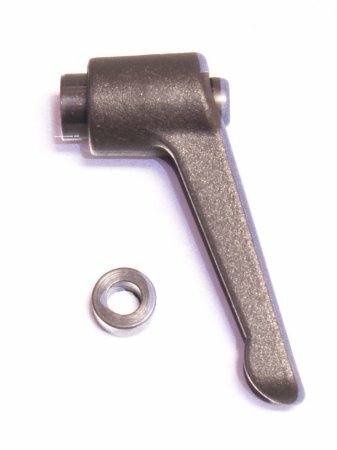 Our Original S-Lever® Tension Lever is an economical replacement for the friction tensioning knob to give you much better control and leverage. 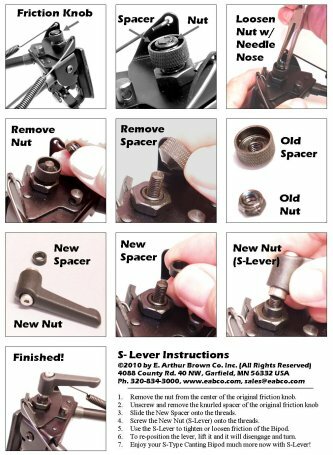 - The S-Lever tightens and loosens the friction tensioning knob with eases and fine adjustment control. Made of fiber reinforced nylon, the S-Lever is designed to flex or break off if it gets over-tightened or hung up on something in the field. Installs easily... Just unscrew the friction nut and replace with an S-Lever. Complete Photo Illustrated Instructions are included. Made in the USA. The S lever makes an already great product better. It was relatively easy to install with the supplied instructions. The lever can be adjusted to lock the bipod as tight as you wish . I would recommend for anyone with an S series Harris. I like these better than the caldwell, theses use sae threads and the others use metric, though they due include an sae adapter. the EABco has better tolerances, Thanks for a great product! I use the lever on my Harris bipods for all of my long range rifles. Very well made and perfectly functional. Highly durable. Great product. Great addition to any Harris bi-pod. I highly recommend it.